In this tutorial you will learn how to add a file to a group. It's possible to add files to a group. This is a lot easier than adding files to users one by one. You can add any file to a group, but we don't recommend to add files files that are very large in size. Step 1. 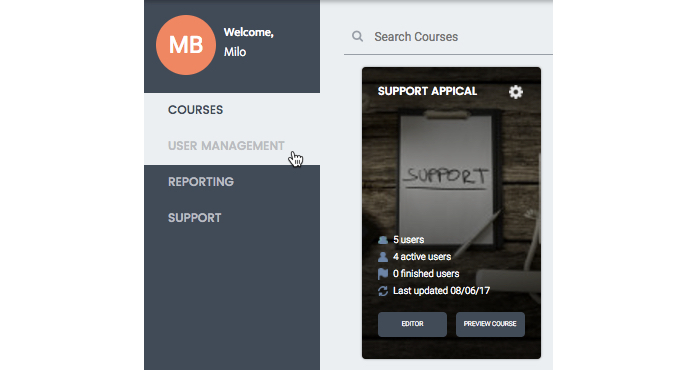 Navigate to User Management in the menu. Step 2. Click on 'Manage Groups'. Step 3. Navigate to the group where you want to add a file and click on 'Edit' in the top right corner. Step 4. Click on 'Files' in the menu at the top. Step 5. Click on 'Add File' and select the file that you want to upload. If found, select the file and click on 'Open' to upload it. It's possible to select a category for your file as well. If you have several files it might help to add them to the correct category to make things more clear for your new hires. You will have to create your category/categories first. Step 6. To add a category, click on 'Categories' in the menu at the top. Step 7. Click on the textfield that says 'Add a category' and type the name of your categorie. Click 'Add' to create the category and click on 'Update' to save it. Step 8. Go back to 'Files' and click on 'Select category'. A dropdown menu will appear with the category/categories that you've just created. Step 9. Click on 'Update'. Hooray! You now know how to add a file to a group!